Manchester United made it five Premier League wins out of five under Ole Gunnar Solskjaer, with Marcus Rashford scoring the only goal in a breathless encounter at Wembley Stadium. Tottenham hadn’t failed to score at their temporary home since going down to Manchester City in October, but they came up against David de Gea at his best on a frustrating night for Mauricio Pochettino and his attackers. 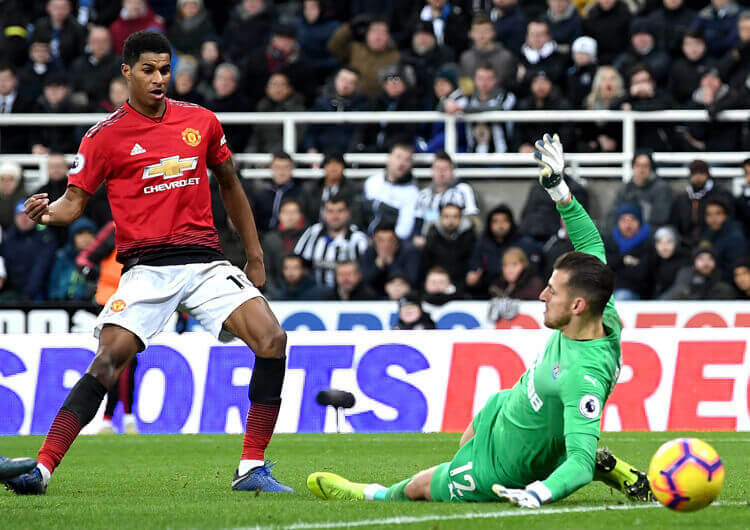 United weren’t without a threat, however, and Rashford maintained his hot streak of scoring form with a confident finish past Hugo Lloris after a superb ball through by Paul Pogba. United are now behind fifth-placed Arsenal only on goal difference, while third-placed Tottenham drop nine points behind leaders Liverpool. 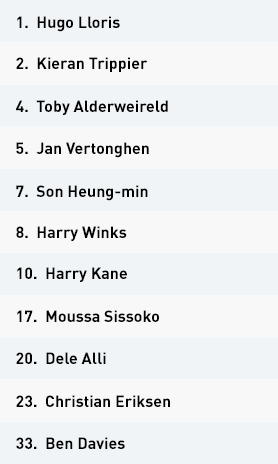 Tottenham Hotspur started the game in their 4-4-2 diamond structure, with Moussa Sissoko dropping out into a false full-back role on the right side. 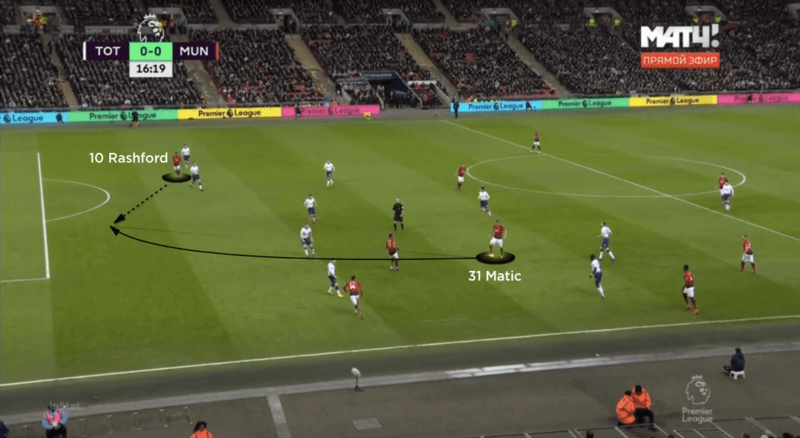 This enabled Kieran Trippier to push forward from right-back – his early cross showed Spurs’ potential threat from the wider areas – while Sissoko’s positioning also provided cover during transitions, where the visitors tried to unleash Marcus Rashford and Anthony Martial in behind. In attack, Son Heung-min partnered Harry Kane in his final appearance before departing for the Asian Cup. His movements in behind, coupled with Kane’s dropping towards the ball, gave the hosts brief penetrations along their left side. 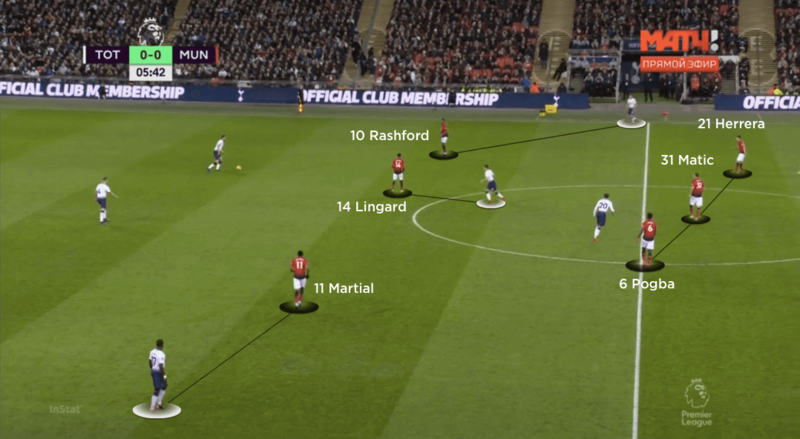 With Manchester United’s full-backs stepping on to Spurs’ full-backs, the visitors’ central defenders had to track Son’s runs away from the central lane, which created gaps for central runners from deep. Spurs soon showed signs of beating United’s aggressively positioned front three. With the centre-backs splitting and both full-backs staying back, Christian Eriksen and Dele Alli offered attacking height; this pulled Paul Pogba and Ander Herrera back in the central lane, leaving Jesse Lingard – who didn’t press as high as Rashford and Martial – unable to block off Winks and Sissoko, who had moved back into a central position. 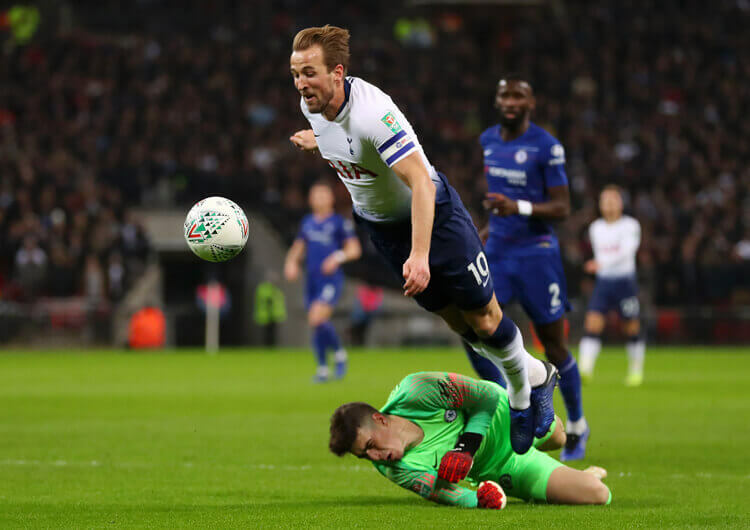 United responded by dropping into a more defensive mid-block, and Tottenham’s build-up suffered another blow when Sissoko had to be replaced by Erik Lamela. The substitute became the point of the diamond, with Alli dropping into a deeper role on the left of the diamond. This saw Eriksen shift to the right, which in turn meant less effective defensive cover for Trippier at right-back. The latter was soon involved in the loss of possession from which Pogba played in Rashford for the game’s only goal. Tottenham’s change to a 4-2-3-1 in the second half allowed Son, Alli and Lamela to support Kane around United’s central defence, while Eriksen linked midfield to attack from a deeper role alongside Winks. Trippier’s attacking threat was again evident, at least until Rashford was moved across to a left-sided role where he could help contain his England teammate – but while Spurs created a host of good chances, they found David de Gea in superb form between the United sticks. Alli, Kane and Toby Alderweireld were all denied by the Spanish number one as Tottenham failed to score at home for only the second time this season. When Spurs lost possession, Manchester United would target the spaces to the sides of their central defence. Sissoko restricted Martial’s early attacking play on the opposition left, but with Eriksen not dropping into the false full-back role on the Tottenham left, Rashford in particular found joy with direct forward runs in between Jan Vertonghen and Ben Davies. Trippier’s aerial weakness was also targeted, as Pogba moved to the inside left channel to compete for long balls from the United back line. As United dropped deeper, the Spurs back line pushed 10 or 20 yards higher – but this also left more space in behind, which Pogba and Rashford took advantage of when combining for the United goal just before half-time. Tottenham’s change of attacking structure in the second half also saw them shift to a 4-4-1-1 defensive block in the second half, with two of the three attacking midfielders dropping back alongside Winks and Eriksen in a midfield four, and the other supporting Kane on the top line. Jesse Lingard’s roaming allowed the visitors to get Pogba into more advanced positions than he had managed in the first half, but the Frenchman was consistently thwarted by his international teammate Hugo Lloris. In the end, it was not the Tottenham defence that cost their team points, but an attack that simply couldn’t beat an inspired David de Gea. When Tottenham had possession, Moussa Sissoko’s covering as a false full-back on the right enabled Kieran Trippier to push higher. Sissoko could then cover Anthony Martial’s forward runs in transition. 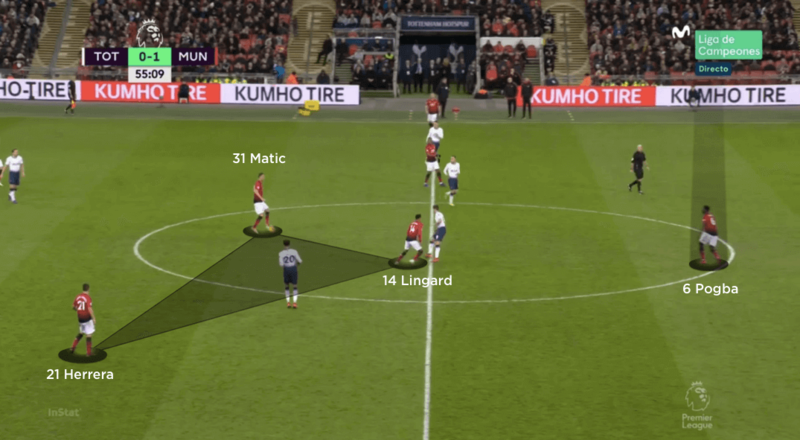 Spurs used the same 4-4-2 diamond formation out of possession, but as their back line pushed higher Manchester United were able to target the increasing spaces in behind them. The hosts changed to an uneven 4-2-3-1 structure in the second half. Christian Eriksen linked defence and attack from a deeper midfield role alongside Harry Winks, while Trippier and Son provided the attacking width. 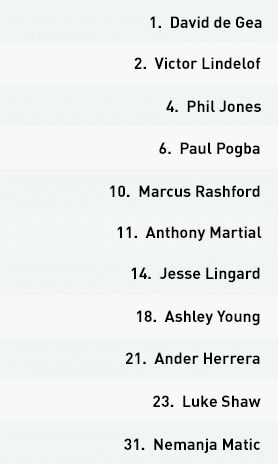 Manchester United set up in an initial 4-3-3 formation, but one key difference under Ole Gunnar Solskjaer is their forward thinking as soon as the ball is recovered in central midfield. Here, Nemanja Matic immediately looks for the direct running of Marcus Rashford. Out of possession, Jesse Lingard looked to cover Harry Winks at the base of the Tottenham diamond. Rashford and Martial blocked access into the full-backs, but were then also in ideal positions to transition in behind the hosts’ back line. Lingard’s dropping movements in the second half helped overload Tottenham’s central midfield, with Paul Pogba pushing much higher to receive and attack between the lines. Ole Gunnar Solskjaer set Manchester United up in an initial 4-3-3 formation, with a front three of Marcus Rashford, Anthony Martial and Jesse Lingard. With Tottenham dominating early possession, the visitors were patient in waiting for their moments to attack. If they couldn’t find a forward pass to one of their attacking trio, they would usually play back to goalkeeper David de Gea to aim direct to Paul Pogba in the inside left channel. When the option was available to play forward, Rashford’s instinctive runs towards goal helped United penetrate in attack while also avoiding Tottenham’s counter-pressing midfield. Lingard’s recognition of Rashford’s first-half runs was outstanding; the pair never once made the same run behind Tottenham’s back line. Should Rashford make a vertical run in the right channel, Lingard held his central position and attacked the penalty area. If Rashford made a diagonal run across goal, then Lingard intelligently rotated out to the right, maintaining attacking width. Ander Herrera’s ability to regain and control any loose balls behind them also helped settle the visitors, with Pogba and Nemanja Matic showing one huge difference to United under Ole Gunnar Solskjær – central midfielders looking to pass forward at every opportunity. 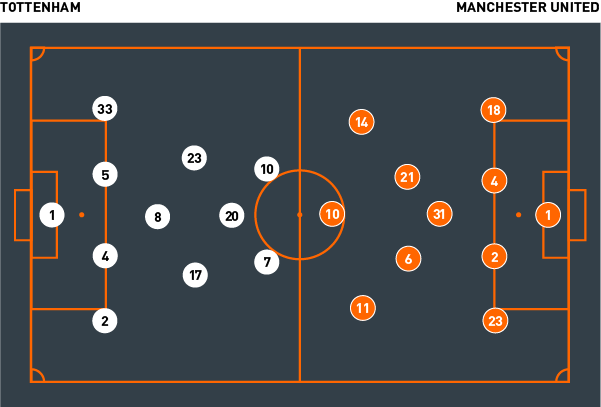 After Tottenham had seemingly solved United’s starting press, the visitors moved to a mid-block, which in the end played to their advantage on the transition. Initially, despite targeting the spaces in behind, Rashford in particular didn’t have enough space to run on to through balls. But as United dropped deeper and Tottenham thus pushed higher, more space became available in behind. Rashford soon took advantage, as Lingard pinched Kieran Trippier’s pass and Pogba played an exquisite early ball in behind for Rashford to finish powerfully across Hugo Lloris. After his superb assist, Pogba became far more active in the second half. Lingard’s dropping away from Tottenham’s central defence created a three-on-two overload in the central channel; this meant Pogba could rotate into a higher position and pick the ball up more frequently between the lines, which in turn helped United maintain an attacking threat despite Tottenham’s dominance of possession. Out of possession, the visitors started in an aggressive 4-3-3 structure. Rashford and Martial occupied the spaces between Tottenham’s centre-backs and full-backs, blocking off direct access into their feet as Moussa Sissoko dropped into a back three. Lingard remained central, his role to block and prevent Harry Winks from progressing the ball into midfield. The only time United didn’t have an answer to the hosts’ build was when Sissoko and Winks dropped short within the central lane, and Lingard was unable to block off both. The visitors couldn’t push a central midfielder on to Sissoko, as this would have freed up one of the Tottenham full-backs out wide. As a result, United gradually moved into a mid-block, allowing the hosts to bring the ball out higher – which, of course, inadvertently led to the visitors’ winning goal. In the second half, Tottenham’s change in shape helped them create more chances against a United block tiring as a result of their commitment to leaving two up front for so long in the first half. 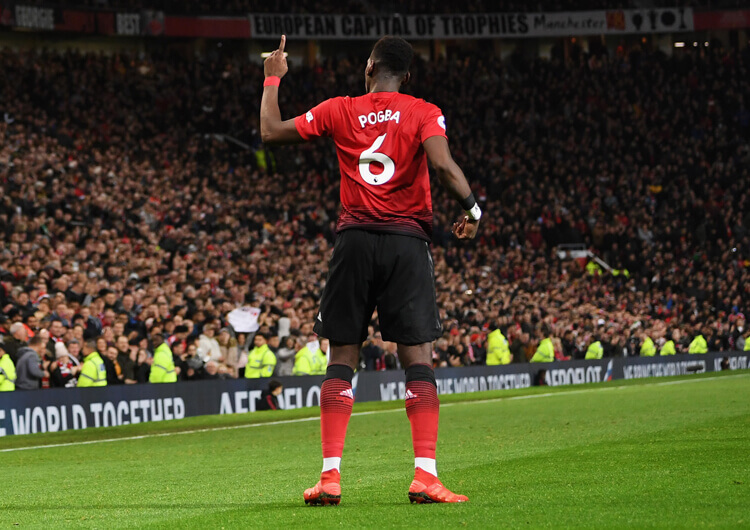 It was no surprise that Solskjaer used all three available substitutions late in the half; Rashford’s move to the left flank and Lingard moving back out to the right naturally lessened Pogba’s influence in attack, but added stability to the block. With Romelu Lukaku holding the ball up, and chasing down any clearance or loose ball, the visitors held on for a fifth consecutive Premier League win under Solskjaer – and are now only seven points behind their victims on the day.